On Tuesday 1st July 2014, thousands of people will embark on a 14-day shared journey; a journey where they start a 14-day Summer Blitz on The Harcombe Diet®. Everyone starts at the same time, and – thanks to a dedicated Facebook page and club forum – can share their joys and woes with others who are sharing the same journey. If you’d like to join us and have the support of thousands of others to help you lose weight and gain health, then sign up to this Free programme. By Tuesday 15th July, you could be up to one-stone (that’s 14lb) lighter and feeling healthier than ever. Certain life-long health conditions may have eased or disappeared. And by eating plenty of healthy nutritious real food. No calorie counting. No gym. No tasteless shakes, potions or artificial, nutritionally-void, low-fat foods. The majority of men and women taking part in our 14-day Summer Blitz will want to shed up to one-stone for their summer holidays or special event. But this is an ideal programme for anyone who wants to lose weight, and gain health, in a short and manageable time period. Many will have had a health scare, and want manage their health at last. Others won’t be overweight, but are just fed up of feeling tired and sluggish all of the time. In fact, everyone will benefit from dumping junk food in favour of highly-nutritious foods that nature provides, and doing a bit more activity. The Harcombe Diet® and it’s free to anyone who wants to participate. Just enter your name and best email address in the form to the right, ensuring that you confirm your sign-up on the following page. We’ll then send you a confirmation page, which includes a workbook for you to download. 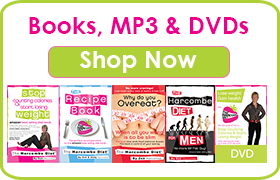 This workbook features details about the diet plan, how and why it works (and has for thousands of years), food lists, meal plans and an introduction to The Harcombe Diet®. From July 1st, we’ll send you daily emails for 14 days, which will be packed full of diet and health advice and tips. You will be able to share your journey with others on Facebook, and we also welcome you to a unique forum where our members and experts are happy to answer any queries you have. And it’s all completely free. Honestly. No catch whatsoever. Apart from a few belt sizes, you’ve nothing to lose. The last time we ran such a Blitz, we had many people wishing that they had the opportunity to share their success story with others both on our website and wider afield. So this year we will give you the option to do just that, as soon as the blitz is over. There is no obligation, of course, but for those who want to continue their journey, lose more weight and keep it off in the long-term, and are willing for us to use their journey as a beacon to others, then we will be offering a more intimate mentoring programme.